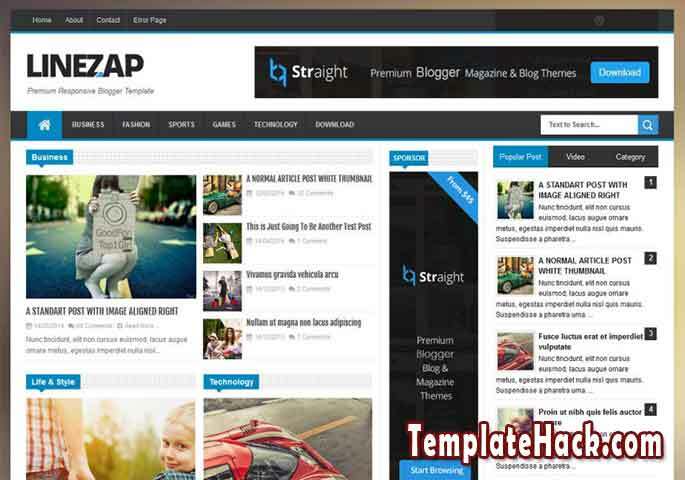 TemplateHack.com - Download Linezap Responsive premium blogger template. Linezap responsive is high quality magazine blogspot template. Linezap has 4 column section to make your blog look like professional portal website. Linezap designed for newspaper blog, but this blogger com template also suitable for other magazine blog such as news blog, sports blog, business blog, tech blog, tutorial blog, tips and trick blog, etc. Ads Ready, Breadcrumbs, Browser Compatibility, Customizable, Drop Down Menu, Grid, High CTR, Page Navigation Menu, Post Thumbnails, Responsive, Search Box Button, SEO Friendly, Social Bookmark Ready, Social Share Button, Tabbed Widget, Whatsapp Sharing Button, Whatsapp Sharing Button, Elegant, Minimalist, Simple, 2 Right Sidebar, Black, Blue, Dark, White, 4 Columns, 3 Columns Footer. Adapted From Wordpress blogger template, Entertainment blogger template, Food blogger template, Gadget blogger template, Games blogger template, Magazine blogger template, Mansory blogger template, Movie blogger template, News blogger template, Newspaper blogger template, Personal blogger template, Portal blogger template, Sports blogger template, Tech blogger template, Technology blogger template, Viral blogger template, Wordpress Look blogger template, Retina blogger template, Wallpaper blogger template.